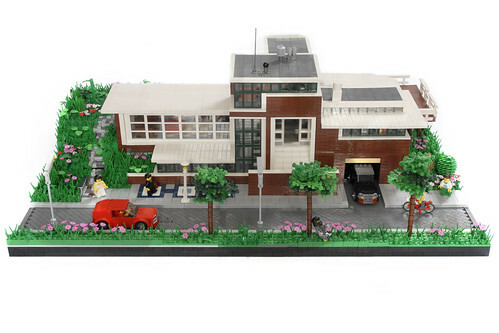 Niek Geurts has put together a really cool (and large) MOC, ‘Huis Ter Dijk’, which was his entry in the Brick Architect contest 2010 (Eurbricks Thread) which has Family Home as the theme. The contest ran from December 11 to January 1st. Geurts entry is based on a real family home that was built in 1930 and is still around and occupied. ‘Huis Ter Dijk’ is a large villa build on a dike near the imaginary village ‘Blokhoven’ (Brickville). It has a living room, study, 2 bed rooms with 1 bath room, kitchen, garage and a pool. It’s build by the famous architect Willy Dublok in 1930, so it’s a state monument. The family who lives there now, has no rights to do anything that changes the building. 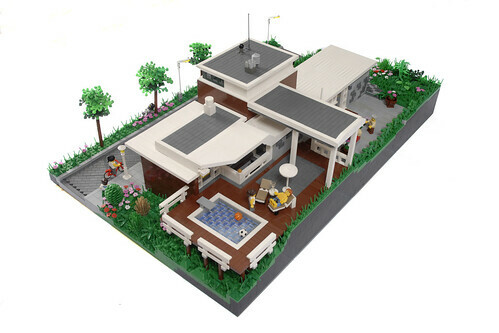 The results of the contest won’t be announced on EuroBricks until the 11th.